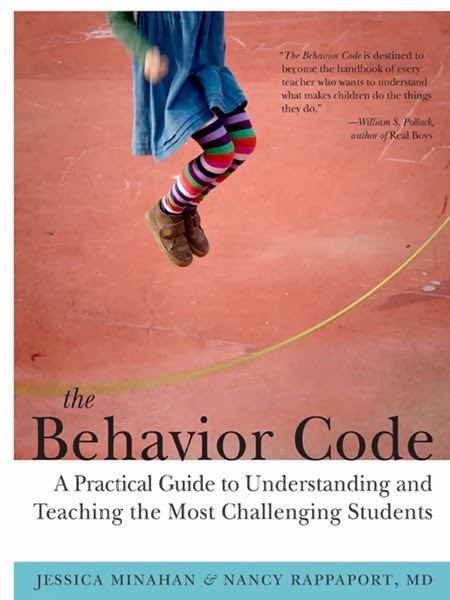 I have worked my way through the book "The Behavior Code: A Practical Guide to Understanding and Teaching the Most Challenging Students" by Jessica Minahan and Nancy Rappaport. It is the first book in a long time that I highly recommend to parents (whether your kids are in public school or you homeschool), teachers, school counselors and other professionals in the field. There are a few passages I am making myself read and reread and reread. I'm stating them out loud to other parents so they will continue to become a more regular thought in my brain. I'm considering tattooing it to the back of my eyelids. As a parent, when I first hear this I immediately have a wave of, "But, but, but .... are we supposed to just say, 'Oh, you are stuck. You can't cope. So, you can just behave however you want to without consequence!'? Because that sounds STUPID and I'm not buying it." Maybe that's just me, but I've felt that a lot when reading books and resources. The feeling is real, even if it's not actually true. When we are juggling challenging behaviors (yes, I know - understatement! ), we tend to focus on the negative. And we just want the behaviors to stop. Because it feels like they never will. Look back at that quote. Find the underlined portion. "Underdeveloped skill." That's where the truth lies. There is a reason underneath the behavior and there are things we can do to help our kids. They need two things from us: 1) patience, space and understanding when they get into that emotional quagmire, and 2) resources and help in developing that skill during the times they are not stuck and triggered. They need both. And when both are provided, they start to slowly develop those skills on a level they are capable, and slowly they will be able to do more of it on their own with less "help" from the adults in their life. It makes sense. Yet, it's hard. It's really hard. Just this morning I wrote to some friends that I'm just tired of it. Today. I would just like a break today from needing to be the person to create that space. And then I preached to myself. Reminded myself that sometimes the best way to create that space is simply to know when to remove myself. Walk away from the battle. Let the battle go. Do the opposite of the fight. I practiced that this morning. When one of my kids gets really stuck, they start to snowball consequences. If they can't get me to engage, they start to try to involve siblings. And it just builds and builds and builds. After a tough night, I was not surprised I woke up to the same need for a fight. I actually did lay out a threat of, "If you can't do a-b-c in the next 15 minutes, I guess I will need to do x-y-z." And I walked away. I could feel it in the air. I had actually engaged in a way that was going to only increase the fight. I had handed them a way to consequence themselves on a silver platter. This ain't my first rodeo. I knew how this could go down. So, I messaged some of my people. I wasn't even sure if they were in a spot to respond to me, so I just started writing as though we were talking it through. I talked myself through it. I reminded myself not to engage. Then I asked myself, "What is hanging in the air? Where have I handed this kid a fight that they most likely cannot walk away from?" That's when I shifted my thinking. I thought of the expectations I had insisted on in the previous twelve hours. I went through the house quickly, while they were in the shower, and did those things FOR them. The only thing waiting for them would be breakfast and walking out the door. Some of the things they had worked so hard to lose the night before were sitting there waiting for them. No big fanfare. Just right back where they were. I removed every argument. And then I started to breathe. I had a huge desire to be sarcastic. I was working hard to remove the fight and the battle so we could get to the other side of this stuck place. But I wanted to jab. Gaaawwwd, did I want to get in a few verbal jabs. I didn't. I made bets with myself that I could get through the next half hour without going there. I promised myself a reward if I did it. I stayed calm and quiet. I took a page from my friend, Lindsay's, playbook and answered all statements with, "Yup." I agreed and kept my commentary to myself. And we got the things done and we got to where we needed to be. On time. Done. They tried to create some new arguments. I was the "Yup. I see that. Interesting" QUEEN! Later, when there is calm and regulation, we will talk through how last night and this morning could've gone differently. I will listen to whatever is said and not correct or disagree. I will give them a voice, and know they are expressing themselves the best that they can. I will create a space to start to develop those things that need to grow a bit. We will utilize our therapist, practice other choices and reconnect, all when we are both in a place that our brains can absorb it. I'm going to try to behave a little better this week, too. And be okay if I have my own underdeveloped skills I need to work on. Have you been in my house, on the wall, wearing a fly suit? Thank you Christine for blessing me with this post, right now, this moment. OhMmGeeeee! Been there stuck for a week almost. Buying book today. Thanks. These hard places are so hard. Funny I spoke to the boys at scouts last week about 'in the moment' discussions. That it's never the right time while you're in the middle of something to be upset, object, argue with authority. That you come back later, when cooler minds are prevailing and say, 'hey, I don't think that was fair' and you'll find it gets a better reaction then arguing during the middle of a task given to you. With that said, your comments about their skill sets are lacking makes a ton of sense. Sometimes the authority (be it parent, teacher, police, etc) have to realize that the person on the other side doesn't have the developed skill sets to deal with the issue. That we have to get through the issue to get to the calm so we can discuss it. *sigh* Oh, and I know I'm horrible about forcing the issue when they don't see it my way quickly enough. Just one more thing to ad to my list of things I need to get better at too. I have to order this book, wow! thanks for bringing to my attention! just come live in my head. and make me do better. please. Makes SO much sense but SO hard to do/remember in the moment. Keeping my sarcastic mouth closed is one of the hardest things for me as well! You are the BEST....and knowing that you are the BEST and still fall into these patterns...it helps. Thanks for sharing! It takes a God-like generosity and forgiveness to love these kids sometimes. Somehow that is what your story reminded me of - the story of the workers in the vineyard. Sometimes love just gives without expecting the return. I'm not so sure about that. I was an awful AWFUL awful tween/teen. I was absolutely capable of behaving and simply elected not to much of the time. I do think maybe you missed many points of the post. There are missing skills that can absolutely be developed. They either need to be developed or strengthened. That was the meat of this post. Giving space to grapple and struggle while actively helping out kids develop those skills. As those skills are assisted and improved, the behaviors change. I am not sure where you read that I am saying our children cannot master these things. In fact, my intent was quite the opposite, and the book I recommended is designed to explain exactly how to do that. Simply expecting compliance does nothing to help develop those underlying skills. Thank you for sharing this! I just bought it for my Kindle. I foster 8 kids with special needs in India and I have 1 child whose behaviours (esp. during homeschooling) are incredibly challenging. I could so relate with the end of your post, writing about how you really had to work to control yourself, your words, making bets with yourself, etc. Can't stop reading it... so much I want to start putting into action. Thanks. Thanks again. Struggling with the misbehaviour of my 6 year old daughter, who is processing and grieving over the loss of her birth parents. Just read another of your post about adoption. Been through hard days. Thanks. Feeling less lonely on this planet where perfect families seem all over the place.